The growth of the online web has made it possible for various industries to promote their business interests online. The insurance industry being no different has prospered deeply with the advancements in technology. The kind of reach that agents have these days with potential customers is unparalleled and the process of selling insurance also has become a lot simpler. 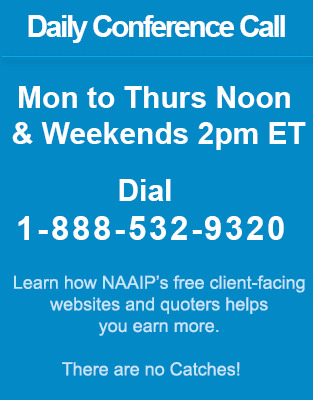 Websites like www.naaip.org/agents make it possible for agents to obtain insurance leads for free. A site like this can be used to generate quotes within specific demographics, which in turn will improve your chances of closing in on a successful sale. Its med sup quote engine can help you get the best possible leads which can be delivered right to your mobile. This makes it possible for agents to remain updated while even on the move. First of all pick the kind of insurance you are interested in selling which can include auto, health, property or other forms of insurance. All kinds of insurance policies have enough scope for advancement and can help you generate neat profits once you have mastered to effectively close in on sales. Hence it would be wise to pick a field that is of interest to rather than looking at how much you money you could possibly earn. The more passion you have for your work, the greater your chances of making money. Once you have picked your area of interest conduct a detailed study of the various products that fall within the category. Understand what are the services that are covered under each scheme and compare the various prices and quotes offered by competing companies. Another good idea would be is to enroll to the various courses of insurance that are offer in every state and you can then take up exams. These online courses and exams seriously and you will be surprised how they will help you out in the long run. Use forums like Naaip to generate effective leads and make it a point to contact these potential clientele as soon as possible. Most people have very little understanding of insurance, hence be open to answering a lot of queries. Invite people to ask you doubts and questions over specific policies and have them answered through mail, social media networks and your own website forums. This will help you generate good word of mouth among satisfied visitors and will generate multiple leads on its own. Newsletters can be an effective way of keeping interested parties in the loop about the new offers and policies available in insurance. It can help pique the curiosity of the viewer and coax them towards going in for a change. Ensure that your site is properly updated with regular information regarding your product portfolio. People always tend to look up the web for more information and hosting your own website means you can direct a lot of traffic to it. Make it a point to include your URL id on your visiting cards and other marketing material. Open your own Facebook page for the insurance you are selling and use to as platform through which you can communicate with prospective clients. Get your site Seo optimized to make its content more relevant to search engine queries. Also make it a point to make the content crisp and interesting. Your visitors must learn something interesting about insurance when they visit your site and that should egg them to contact your for more information. Also use paid for paid for click advertising to reach out to more people on the web. Join Googles Ad words program through which you can target specific crowdsweb pages with ad of your company. This will help you open if your business prospects to a very wide bunch of potential clients. Use forums like LinkedIn to stay connected to other insurance agents such as your self. You would be surprised how much you could learn from a forum like LinkedIn on a regular basis. Build a strong network with other agents and help one another to generate and refer leads. For e.g. : An insurance agent can refer a health lead to medical insurance agents and vice versa.